ISLAMABAD, Pakistan (CNN) -- Back-to-back suicide bombings killed at least five people at a university here Tuesday and wounded nearly two dozen, authorities said. 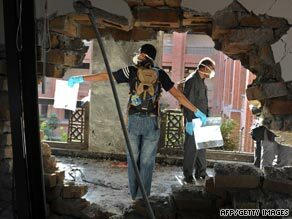 Police investigators collect evidence at the suicide blast site at Islamic International University in Islamabad. The explosions occurred at the International Islamic University in the Pakistani capital, said police official Bin Yamin. Naeem Iqbal, Islamabad police spokesman, said three men and two female students were killed, and 22 people were injured. At least four of the injured were in critical condition, said Altaf Hussein, a doctor at a hospital. All the victims are between the ages of 18 and 25. Virk said he saw several injured students with blood-soaked clothes being taken away by rescue crews. More than 12,000 foreign and local students, including 5,500 women, are enrolled in the 29-year-old university. The university Web site describes the school as a "unique center of learning in the Muslim world which strives to combine the essentials of the Islamic faith with the best of modern knowledge." In recent weeks, Pakistan has been relentlessly rocked by a wave of suicide attacks as Islamic militants retaliate against a military offensive to rout insurgents operating along the Pakistan-Afghan border. On Friday, a suicide car bomber detonated near a police station in Peshawar, the capital of the North West Frontier Province. The blast killed at least 13 people, most of them civilians. A day earlier, militants attacked two police training centers and the country's Federal Investigation Agency in Lahore in eastern Pakistan. At least 30 Pakistani police officers and civilians were killed in those attacks. At least 10 attackers also died. And on October 10, militants held dozens of hostages for 22 hours inside an army headquarters in Rawalpindi, which neighbors Islamabad. Eleven military personnel, three civilians, and nine militants were killed in the siege.